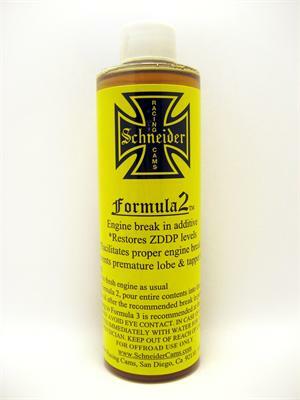 Schneider Racing Cams offers a proprietary blend break-in engine oil additive. This lubricant has high levels of zinc and phosphorus to protect the cam and lifters from premature wear. This product helps replace the protective properties that have been removed from engine oils which cause tappet lifter failure. This product can be used anytime, but must be used during the break-in period. Come in an 8 oz bottle.